No, this is not about online fights. 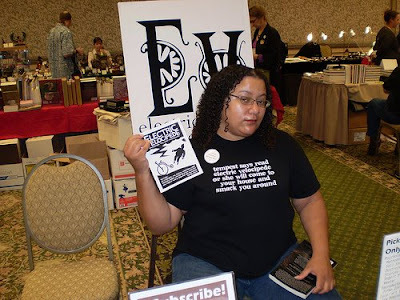 As many of you know, I have a story in the latest issue of the Hugo award-winning zine Electric Velocipede. The editor asked if he could put my story online in its entirety to tempt people into buying the whole issue. I said yes immediately because I heart having my stories both online and in print. Today it went live, so you can check out Enmity on the EV website. I hope you enjoy. This was my first Mythpunk story (before I even knew what Mythpunk was!). I was inspired by the stuff I learned in my creation myths class. Like Black Feather, I drew from many different versions of myths and many different myth traditions. It’s pretty cool the connections you can find by just looking for common elements and symbolism. 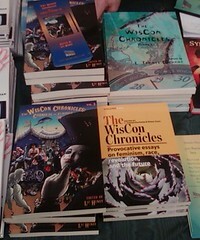 At WisCon I was able to quietly sneak away with a copy of the latest Electric Velocipede (issue 17/18!). I was super excited to see it because my story Enmity is contained within. There are also stories by many friends of mine, including two other Altered Fluidians: Mercurio D. Rivera and Matthew Kressel. This May has been especially awesome for me because I had stories in a book and two zines come out this month. Federations, Sybil’s Garage 6, and Electric Velocipede 17/18 — and all of them were available in the dealer’s room. 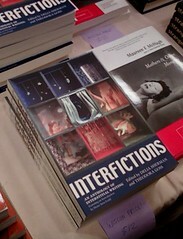 There were also many copies of the Interfictions anthology and all three WisCon Chronicles! I’m in each, and the newest one is especially spiffy with a fantastic cover. Liz Herny is a goddess. 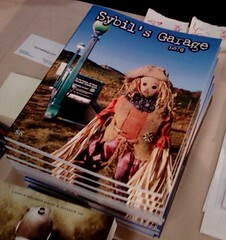 So I encourage you to order your copy of Sybil’s Garage if I didn’t force it ony ou at WisCon, to buy Federations and WisCon Chronicles vol. 3, to check the Electric Velocipede blog to see when the latest issue will be available for ordering (the copies at WisCon were special advance ones — contributors and subscribers should get theirs soon), and to read, read, read, not just my stories, but all the fabulous stuff in these offerings. May 2009 is a month of awesomeness. Isn’t it lovely? Also, I must point out that I’m sharing a TOC with fellow Altered Fluidians Mercurio D. Rivera and Matthew Kressel. Also of note: Richard Bowes, Yoon Ha Lee, and Caroline Yoachim. Yes, I do see Will Shetterly, too. I am trying to pretend he is not there.